In an effort to halt protest against Keystone XL pipeline, TransCanada corporation has taken to labeling protesters as “terrorists”. In particular, they are targeting Nebraska citizens who have conducted peaceful, nonviolent protests – going so far as to hold “educational” sessions with local law enforcement on what the foreign corporation perceives as “terrorist threats”. Let me repeat: a foreign corporation, that has used eminent domain to take land from ranchers (in TX and other places) is claiming that US citizens protesting their actions are “terrorists”. The group Bold Nebraska used Freedom of Information requests to obtain documents TransCanada presented local law enforcement in an effort to portray law-abiding US citizens as a “threat”. “When TransCanada said they had a right to forcibly take part of my family’s farm for their Keystone Pipeline project, we knew it was time to stand and fight. TransCanada offered a paltry one-time sum, but as we have maintained, this is absolutely not about the money. This is our family saying no foreign corporation who appears to be building a project for their own financial gain should have more of a right to our land than we do. 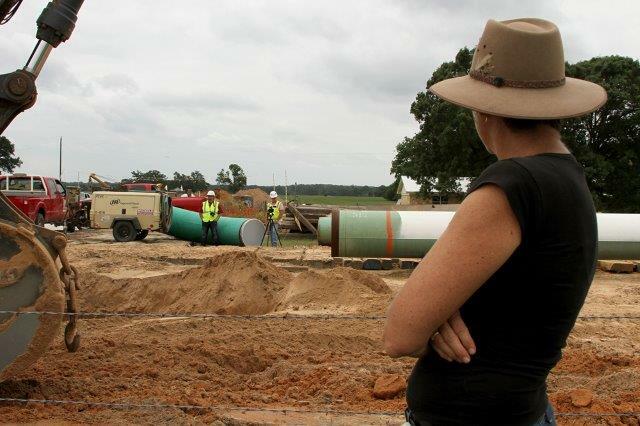 Despite the pending court case, TransCanada began constructing the Keystone XL pipeline on her land. Repeat: Despite a Pending Court Case to determine whether the foreign corporation has the right to claim her land using eminent domain (a right reserved for US government)…. Because Julia has protested in a most lawful way, TransCanada has decided to use intimidation tactics: they pay a worker to film Julia at all times and send a helicopter over her land every few minutes to monitor her. Remember – this is not a government taking this action, but a corporation – and a foreign corporation at that. Julia writes about the whole fiasco on her blog, with lots of photos.